With rich industry experience and knowledge, we are committed towards offering an excellent quality range of Desk Calendar. With sincerity and hard work of our professionals, we have carved a niche for ourselves in this domain by providing a premium quality gamut of Desk Calendar. - Code : VA - 0142. - Code : VA - 0141. - Code : VA - 0140. - Code : VA - 0139. 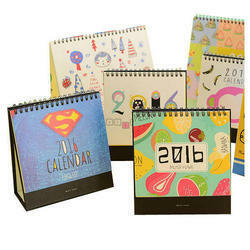 We offer corporate gift items like Desk Calenders that are widely demanded by various corporate houses. The corporate gift items that we deal in are supplied to far flung areas and that too as per the committed time period.